Boulder, CO: Westview Press, 1999, 526 pp. The United States spends over $25 billion a year assimilating and monitoring security-related information around the world. Every hour of every day reconnaissance satellites, radar bases, signals intelligence systems, aircraft, vessels, and clandestine agents are marshaled in a prodigious effort to read the pulse of global politics and foreign enterprises. The U.S. Intelligence Community is the first comprehensive portrait of the labyrinth of U.S. intelligence-gathering organizations whose true dimensions remain shrouded in secrecy. Through the Freedom of Information Act, incisive interviews, and scrupulous research, Jeffrey Richelson has outlined the internal structure of the 30-odd organizations that comprise the U.S. Intelligence Community, and unveils a world known to most of us merely in terms of moles, spies, and spooks. Richelson charts the evolution of the CIA, FBI, and military intelligence agencies and reveals the interrelationships between today's multifarious and awesomely sophisticated intelligence complexes. How are national security agendas born and carried out? What are the hierarchies and lines of power that shape and support U.S. intelligence network? Who manages the intelligence-collecting activities, and who hands down the orders for overt or overt involvement? More lucidly and more extensively than any single volume before, The U.S. Intelligence Community uncovers what intelligence is, who it is done by, and how it is perpetrated, interpreted, and used. "Fast as the CIA changes, Jeff Richelson is there, with excellent sources and a solid grasp of the official terrain. This edition of The U.S. Intelligence Community is the best yet, offering a detailed picture of the mosaic of spy agencies, which is in many respects completely different today than in 1989, when Richelson last profiled the field. 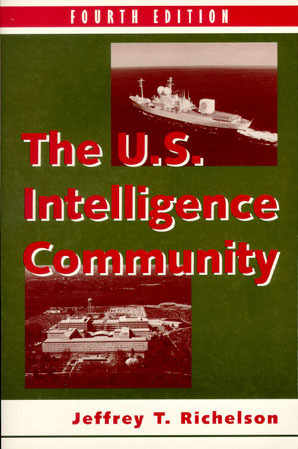 The U.S. Intelligence Community will be vital for any reader who wants to understand the evolution of American Intelligence in the post-Cold War world." "The U.S. Intelligence Community is essential reading for all who wish to know what lies behind the vast and complex spy world. Jeffrey Richelson does a magnificent job of fitting together the myriad pieces of the U.S. espionage puzzle." "Jeffrey Richelson's new edition is still the best, most comprehensive overview of U.S. intelligence. Required reading for anyone interested in what goes on behind America's cloaks and daggers." "The authoritative survey of the American cloak-and dagger establishment." "The authoritative bible on the modern American intelligence establishment." "This book should be within easy reach of anyone casually or seriously interested in American Intelligence." Jeffrey T. Richelson is a Senior Fellow of the National Security Archive and the author of many books on intelligence including America's Space Sentinels: DSP Satellites and National Security, America's Secret Eyes in Space, A Century of Spies, and Sword and Shield: The Soviet Intelligence and Security Apparatus. Return to National Security Archive Staff Publications.